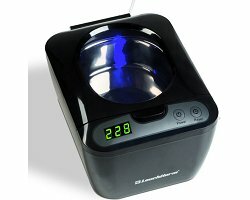 Ultrasonic cleaner for gentle, thorough cleaning of coins, medals, spectacles, jewellery, dentures and braces, cutlery, CDs and DVDs, stationery and assorted small metal items from around the home or garage. The high-frequency vibrations produced by the ultrasonic waves get rid of dust, smears and dirt from both surfaces and inaccessible areas. The hinged lid with a large observation window can be opened at the touch of a button. Stainless steel bowl with a close-weave removable basket, as well as holders for watches and CDs/DVDs. With a digital display to show the cleaning time to the second. It features 5 different time settings: 90, 180, 280, 380, and 480 seconds. Capacity: 600 ml. Cleaning frequency: 43 kHz. Mains-powered (European plug). Overall size: 165 x 232 x 126 mm (6 1/2 x 9 1/8 x 5"). The device uses water to clean. The cleaning process can be enhanced by adding LEUCHTTURM universal coin-cleaning fluid (Ref. No. : 318 851). Ultrasound cleaning is also recommended in preparation for chemical cleaning using LEUCHTTURM coin-cleaning fluid.